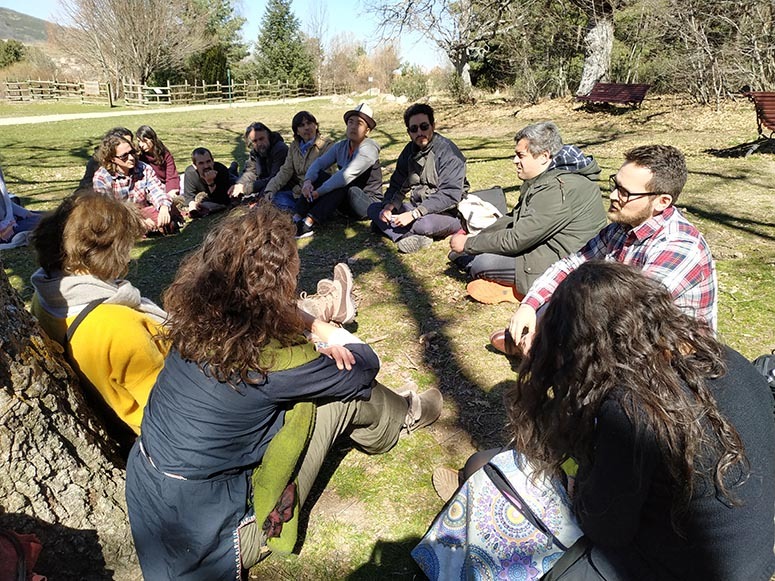 A GEN Alumni reunion at ‘Territories of Life: Areas conserved by indigenous peoples and local communities’ event, Valsain, Segovia Province of Spain. From the 18 – 20 March 2019, four GEN Alumni – Ugo D’Ambrosio (GESA 2014), Anna Varga (GESA 2014), Emma Courtine (GESA 2018) and Aili Pyhälä (GESA 2014) – met at the Spanish National Center for Environmental Education (CENEAM) in Valsaín, the Segovia Province of Spain. In this stunning place, just touching a mountainous and forested national park, three gatherings took place to discuss ‘the Commons and Territories of Life’. These are understood across the world as areas and territories conserved by indigenous peoples and local communities, also known as ICCAs. 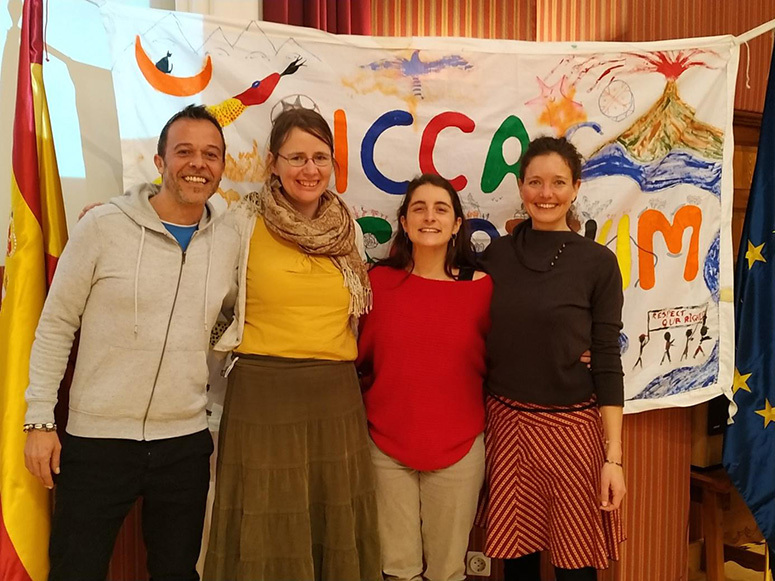 The first day was co-led by the International Land Coalition and concerned territorial commons across Europe, the Middle East and North Africa, while the second day was the Regional Assembly of the ICCA Consortium. The remaining days were devoted to the international Permanent Seminars on ICCAs – Territories of Life. This is the result of several years of joint work within the region to highlight territorial commons, regardless of whether or not they are recognised by States as protected areas, and thus key elements of nature and cultural conservation, as a means of resilience in the face of climate change, and as means for enhancing well-being.The meetings were spread over the course of six days, bringing together some eighty people from across Europe and Russia, including representatives of local and indigenous communities. It was also a moment of reunion for us four members of the Global Environments Network, via our GESA connection! From left to the right in the photo: Ugo D’Ambrosio, Anna Varga, Emma Courtine and Aili Pyhälä. Across generations, simply knowing that all of us are part of the GEN Family allowed us to rapidly gain mutual trust, support and a will to work together! It is indeed powerful and refreshing to realise that across a network, and although we participated in different years of GESA, we have the same perception of humans being entirely part of nature. As Aslak Holmberg from the Saami Council pointed out in one of the sessions: it is not only about living in harmony with nature, but about living in harmony in nature. During our experience in Valsaín, we learnt and acknowledged that establishing ICCA recognition involves intensive and extensive work of investigation in each country to first understand the national political process. We also learned a lot about the difficulties in several ex-USSR countries when it comes to revitalising their commons. 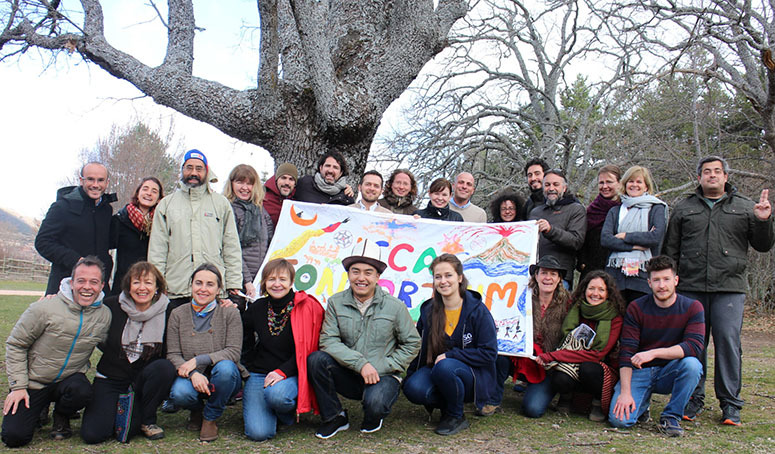 It is also crucial to highlight the fact that commons are not isolated, and creating a critical mass, such as Iniciativa Comunales, (the Iberian network for the Commons), facilitates action toward appropriate recognition of territories of life. We heard presentations on discussed definitions of ‘community’, ‘territory’ and ‘conservation’, bringing us to update the very definition of ICCAs – Territories of Life. Acquiring a broader vision of ICCAs across the world, we also took time to debate on inputs for providing to the Convention for the Biological Diversity (UNCBD) during the forthcoming Regional Consultation of the Post 2020 Global Biodiversity Framework. It was an occasion to exchange views regarding the importance of working on the governance of natural resources and territories, about the threat and obstacles that the European Common Agricultural Policy (CAP) continues to place on nature conservation and local health and wellbeing. We also discussed the need to support gender equity in Territories of Life, the importance of Territories of Life in enhancing human rights, and the need to develop concrete actions to protect and support both Territories of Life as well as their defenders. More specifically, Ugo shared about the work he is doing, together with the Global Diversity Foundation, in the High Atlas cultural landscapes in Morocco. Anna explained her current work and perspectives with local communities and municipalities in Hungary. Aili and Emma (Council member and Program officer, respectively, of the ICCA Consortium) hosted the Regional Assembly. Aili also facilitated a session on Sustainable Livelihoods, and shared recent developments in strengthening the work in the Circumpolar North (which goes way beyond Europe of course). Emma is currently beginning to explore potential ICCAs in France. Now that these links have been made, it is time to become this critical mass: to continue exchanging our experiences, feed our knowledge and approaches, and explore and elaborate strategies together.